We love cooking, food tastes so much better when you have made it and even grown it yourself. You know all the ingredients that have gone into making it so can keep it healthy and additive free best of all is sharing it with friends! The last day of term was the "RHS Get your Grown Ups Growing Fun Day" with lots of different activities going on all day, planting, painting pruning and having lots of fun with our parents and relatives in the garden. We have been doing lots of work on Autumn and of course Harvest time so we used the apples in our garden to make a simple apple pie. Being a FAIRTRADE SCHOOL, we of course use Fairtrade ingredients where we can such as lovely rich demerara sugar and Cinnamon spice (from the Fairdo's/Siop Teg in Canton). Next term the children will be producing a new Eco code and asking everyone at Millbank to sign it saying that they agree to it. One of the items for the last few years has been promoting FairTrade because we think being FAIR to people is very important. 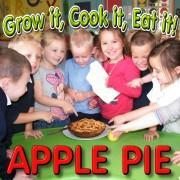 Being cooking we could also talk about the science and watch as the cut apple reacted with the air and went brown. When we put some apple in an acidic orange juice it did not go brown as fast. We also kept the seeds or pips from the apples. With the short crust pastry that was left over we made little heart shape biscuits too! Gardening is another fantastic activity that the children enjoy from planting to digging there will be an activity that they are great at. The RHS Campaign for School Gardening is a lovely way of getting recognition for the children's efforts.